Pictured left to right: Nadia Giordana, Sylvia Wilkins, Norman Wilkins and Chuck Kasun. 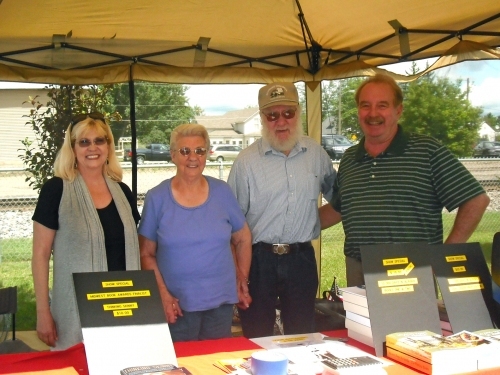 We had a good number of visitors at out booth at the fourth-annual, Two Rivers Music Fest and Craft (and book) Fair on July 24-25 2010, in Motley, Minnesota (where we farmed for 25 years before going to Alaska). Daughter Nadia signed copies of her book, Thinking Skinny, and we offered the complete 3-volume documentary journal, 10,000 Days In Alaska. Books 1 & 2 on hand, and took orders for book 3. Great to see so many old friends. Norman it was great to sit and visit with you and Sylvia at the fair in Motley. It seems I was fairly familiar with your Alaska days…but did I have enough questions? I did mean to ask you what about Alaska would you have brought back if you could? And I still think Sylvia should publish a cookbook of all those meals and wild game she prepared. I will always think of you when someone mentions Sand Hill Cranes or following your dream. Thank you for sharing your journals with us!